Chattanooga Times Free Press entertainment reporter Casey Phillips spoke with Josh Crowe, lead singer of the traditional bluegrass band The Crowe Brothers, about the lost art of the brother duet, the magic of playing the Grand Ole Opry and how satellite radio is changing their business. CP: How did you and Wayne get your start playing music? JC: We were both raised in the little town of Clayton in Northeast Georgia. Our dad was a musician and got us into the music business. We've been a musical family all our lives. That was kind of the start of our music business. We didn't know anything else because we grew up in it. CP: Was it a foregone conclusion that you would end up being musicians yourselves? JC: Yeah, it kind of seemed that way because from day one, our dad was in the music business. Actually, he started out pretty big. In 1960, when I was about six years old, he got to go and play on the Grand Ole Opry. He and his band won something through the Pep Milk Talent Contest that got them a spot on the Grand Ole Opry with their three-piece bluegrass band, the Sunshine Melody Group. That made my dad a pretty big star back in the day. Our household in the music business seemed bigger than others in the region. He seemed like a star to them because he played the Grand Ole Opry in those days. Then my brother started. From the time we were big enough to pick up a guitar, we were playing and backing up my dad, who played banjo. By the time we were 12 or 14 years old, we were in a local band playing at home. By the time we were in our mid teens and getting out of high school, we started our own band. That's when we met our buddy Raymond Fairchild from Maggie Valley. That gave us our first job in the music business for the next 15-plus years. 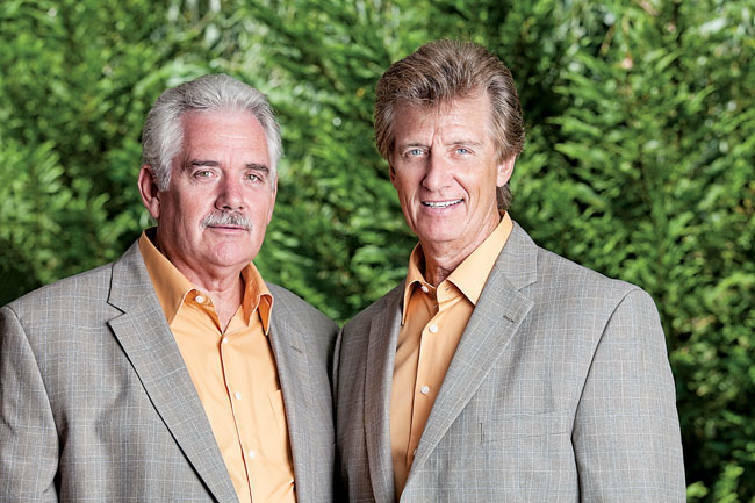 We started out on our own in the 1990s and started The Crowe Brothers. We came here to Maggie Valley, N.C., in 1975 when we started working with Raymond. We played the theater scene here in Maggie Valley and still do. Our home base is The Stomping Ground in Maggie Valley, which used to be where TNN filmed Fire on the Mountain. That's where we work on Thursdays and Friday nights when we're not out on the road. CP: You and Wayne split up for a while before coming back together in 2008. What happened to send you in different directions? What brought you back together? JC: We did. In the mid-90s, Wayne got off the road for a while. If you've ever been in the business, you always hear everyone talk about the "rigors of the road." It's hard on family life and everything traveling all the time. To make a living in this business, you are on the road pretty much all the time. He took a break from the business, and when he did, I recorded with my buddy David McLaughlin, who worked with a band called the Johnson Mountain Boys out of the Washington D.C. area. He and I had been friends for a lot of years, and when the Johnson Mountain Boys disbanded and the Crowe Brothers had taken a leave off the road, David and I got together and recorded the Crowe/McLaughlin record for Rounder Records that was a pretty popular record for us. CP: How did you and Wayne end up on the Grand Ole Opry? What made you leave? JC: We started playing the Opry with Raymond back in 1978. We played right on up into the '90s. When we were working with Raymond, we did that, and David McLaughlin and I played the Opry together. CP: What was it like seeing your dad play the Opry for the first time? Were you awe struck? JC: Well, I just grew up in it. I don't remember it ever being that way. From the time I was big enough to remember it, I always remember my daddy sitting around playing the banjo. It was no big thing. I didn't pay much attention to it, truth be known, until he played the Opry, and I didn't even realize how big that was back in 1960. Playing the Opry back in 1960 and playing the Opry today - it's still a big thing, but back then, if you played the Opry in 1960, people looked at you having made it big in the music business, period. When that happened, I know it changed my daddy's life. It automatically took him to the top of the heap in our part of the country from having gotten to do that. CP: Had the Opry's reputation changed enough that it didn't seem as significant when you and Wayne played there yourselves the first time? JC: Oh no, when you step on that Grand Ole Opry stage, no matter how you step out there and play music, you feel like you've made it. It still gives you that feeling. Don't get me wrong, the Opry is still a big thing. It's changed from what it was back in those days. Many of those Opry greats have died off and gone, the ones who made it what it was, but the Grand Ole Opry is still a great thing. I grew up with that in my life. The music business was mentioned from the time I was three years old on, and you hardly ever mentioned it without thinking about the Grand Ole Opry. I've got a lot of friends that retired from the Opry who are still good friends of mine, including Eddie Stubbs, the announcer. They're still there, but of course, many of my friends have died away, like Roy Acuff. We were good friends with Roy and all his band members. We were close friends with those guys. CP: Now that you've been at it for 40 years or so, are you where you expected to be or has your career taken twists and turns you wouldn't have expected? JC: Well, I would say that the time that Wayne got off the road and stayed away, that could have been somewhat of a setback. If you get out of the business and stay out a few years and then come back in, there's ain't no way it can't hurt you or give you a setback. But that being said, now that Wayne and I have been back together for the past six or seven years, when he came back, everything we had going for us then came right back to us, recording contracts - the whole nine yards. As we speak, last week, we had the No. 1 on Sirius XFM radio and the No. 2 album. We're currently No. 5 on Bluegrass Today's charts, which came out today. To take a leave from each other like that and come back and be able to be where we're at right now, I feel very fortunate for that to be happening. CP: What do you think makes you the exception to the rule? JC: Because we're doing something that's not out there to be heard anymore. That's why our record "Bridging the Gap" got its name. We've been in music now for 40 years since our early teenage years when we were just kids out of high school. We're the ones carrying on that tradition - with a new spin to it - from the 1950s and '60s era of brother duos like The Louvin Brothers. We're doing that, but we're doing it with our own sound as well. That's why our music is doing what it's doing because in a sense, as far as our singing, we've not got any competition because there's no one else out there doing that. It's obviously ringing a bell with a lot of younger folks because we wouldn't be where we are on the charts if that weren't the case. That's why I say "Bridging The Gap" was a perfect name for the record. We have a bunch of new songs on there. Most of the songs on there are new, plus what I wrote. There aren't too many old, old songs on the record. CP: Do you write with that sound in mind? JC: I don't intentionally have that old sound in mind. We've got that older sound, in a sense, but we've also got a new sound going on with the band we have behind us. It's old sounding music but with a new twist to it. All the reviews of the new album are seeing it that way on their own. I'm seeing reviews coming out, and that's their spin on the record - that it has that old, vintage sound but with a new twist. CP: What is that twist? JC: Well, the music for one thing, the caliber of the musicians we have with us. Our banjo player, Steve Sutton, is one of the best in the business. The boy who plays mandolin with us is from your area - Brian Blaylock. You don't get no better musicians than those guys. CP: How long has Brian been with you? JC: He's been with us for a little over a year now, but he's worked with me off and on for years, ever since he was a kid. CP: What benefit is there to singing with a family member? JC: You grow up together, and when you grow up together, you talk the same and you phrase your words the same. Everything about your speech is the same. When I worked with David McLaughlin, he and I came from totally different worlds. He was raised in Washington D.C., just two or three blocks down from The White House. David had to work at it a little more, in a sense. When Wayne and I sing a line in a song, it comes out sounding that way because we talk the same. I think that's what all the brother and family bands have done up through the years that makes their harmonies so tight. They speak the same. Everything about them is learned the same way. CP: Are there any drawbacks to singing with your brother? JC: Well, we go through scraps all the time. [Laughs.] That may be why he left the road for a while. I'm the one out front doing all the talking, and I've always done that. Even though I'm the younger of the two of us, I've always been the more outspoken of the two. Wayne is more laid back. CP: Do you both write for the band? JC: He's done some writing. We haven't, at this time, recorded a song that Wayne has written. We have a gospel project in our mind that we've been trying to work out doing for some time, and there will probably be some of his songs on there when we do a gospel album. CP: How would you contrast your writing styles? JC: They're not so much different, I wouldn't think. Not a whole lot. He just tends to not write as much as I have. I'm not a songwriter who's going to sit down and write for someone else. I've always been the type where the few songs I've written have been for myself. I'd always write one when the right moment and the right melody comes along ion my head and try and write it down before I forgot it. CP: Sounds like you almost need to be ready to write something down at the drop of a hat. JC: Yeah, well, that's probably true. I've probably thrown away 10 times as many songs that would have been great songs because I didn't have something to write them down with and thought of them at the wrong time. CP: What significance is there to being so well received on satellite radio? Has that outlet been pretty significant for you two in terms of building an audience? JC: Take for instance Sirius XFM. It's put our music out to a larger audience than radio ever has because anybody who has it, if they like bluegrass, they can punch a button and get a bluegrass show. In today's world, Sirius is doing for our music business like no other radio has ever done, short of the Grand Ole Opry back in the day. It don't make any difference what kind of music you like; if you have Sirius radio, you can punch it in and get it 24/7. CP: Do you have a Sirius in your own car? JC: My wife has it, but I don't have it in my pick up truck. CP: What were your intentions going into the studio to work on "Bridging the Gap?" What did you hope to accomplish? JC: I don't think anybody has ever gone into a studio - especially if you're already signed with a label - without the hope of having a No. 1 song. If they tell you they aren't, they're telling you a lie. Not that that happens to everyone, but everyone has a dream when they record an album of wanting it to do good. We've been lucky to have two No. 1's off our debut album with Rural Rhythm. We had two songs that went to No. 1 on Sirius. We already have another No. 1 on "Bridging the Gap." CP: Any chance you're working on another album or are you going to let "Bridging the Gap" simmer for a while before you start thinking of the next project? JC: This new album is just getting out of the gate, and it's usually a year to 18 months before you come out with another record. You gotta let it get the wind out of it before you do something else. It'll likely be next year before we work on that.